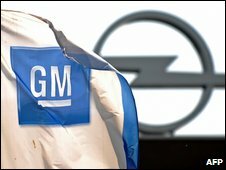 General Motors (GM) has said that it will not be closing any of Opel's four plants in Germany as part of its restructuring plans. The US carmaker also said it would be cutting about 9,000 jobs in Europe, slightly fewer than the 10,000 it originally estimated. It also said the future of the Antwerp plant was uncertain. Earlier this month, GM cancelled the sale of its European operations to car parts maker Magna. GM's European boss Nick Reilly said he saw Opel's Eisenach plant as "a significant resource for the production of [Opel] Corsas for the long term". He had previously given assurances over Germany's three other Opel plants. "We have to reduce costs so we can make money in a lower [sales] market. There will be difficult decisions and we will reduce capacity by around 20%, or 9,000 people," Mr Reilly said. About 50% to 60% of the job cuts would be made in Germany, he said. 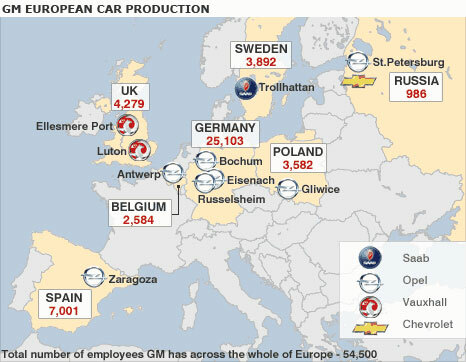 This means that about 4,000 jobs will have to go at GM Europe's plants outside Germany. The Antwerp plant employs about 2,500 people. Vauxhall's two plants in the UK, at Luton and Ellesmere Port, employ more than 4,000 people. Mr Reilly said that the carmaker was now entering a consultation period, which he hoped would be completed in December. Only then would GM be able to give specific information about which plants would be affected by job cuts, he added. He also said GM's European headquarters would be based at Germany's Ruesselsheim plant. GM pulled out of the deal to sell Opel and Vauxhall to Magna after months of negotiation, citing "an improving business environment". The decision caused anger in Germany and sparked walkouts at German plants. The German government had provided 1.5bn euros ($2.3bn; £1.4bn) in bridging loans and had pledged a further 3bn euros to help secure the Magna deal.